Researchers at the Carnegie Mellon Human Computer Interaction Institute, together with Microsoft have developed a new system called the OmniTouch which has been designed to transform any surface into a touchscreen device. The system consists of a pico projector and a motion detector that is mounted on to the users shoulder. 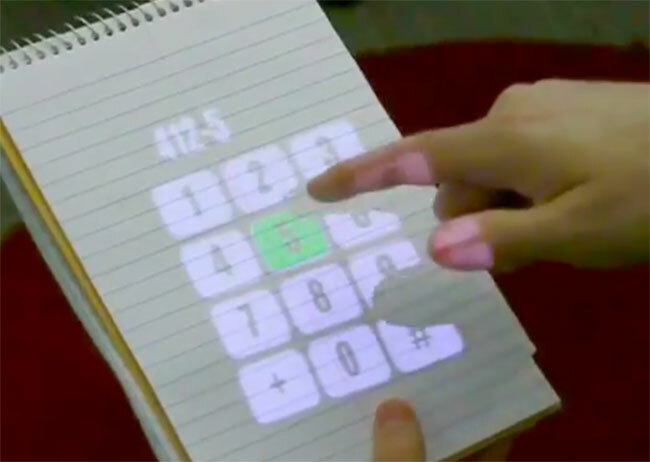 It then projects a user interface onto any surface that is in front of the user, be it a user’s hand, notepad or anything else, enabling the users to then interact with the interface via touch. Watch the video after the jump to see the OmniTouch system in action. Currently the OmniTouch system is still under development and the shoulder mounted gear is still far too cumbersome to make the project commercially viable in its current state. However it’s a great proof-of-concept design which enables the researchers to test out their OmniTouch system in a number of different environments and situations. Let’s hope they can reduce the projector and OmniTouch technology into a convenient size package over the next few years so that we can all benefit from this touch surface technology very soon. What are your thoughts, is it something you would use? The project is being unveiled during UIST 2012, on October 16-19 in Santa Barbara, Calif.